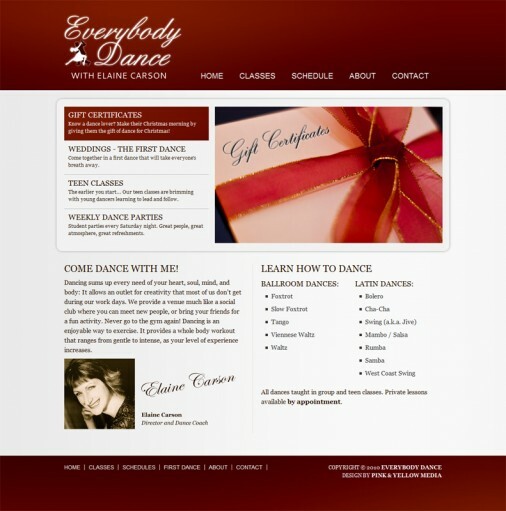 This summer Vancouver Ballroom Dance Coach Elaine Carson of Everybody Dance approached us asking for help with her website. She got a site build several years ago that at the time was top-of-the-line, but in the past few years she saw a dramatic decrease in the number of visits to the site and the number of new dancers coming through her doors after finding her online. A quick look at the site and the code behind it painted an all too familiar picture that I keep seeing again and again: The site was build using tables (correct some time ago, absolutely wrong today) and was static in every sense of the word. 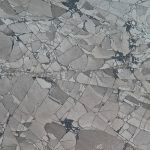 As a result the Google rankings were stagnant, the site was hard to index and even harder to find and it was pretty much impossible to update without a lot of workarounds and fixes. I say this is an all too familiar sight because more and more clients come to us at Pink & Yellow Media with sites of just this type: Built with old software to old standards and often in a way that makes them almost impossible to update and manage. The bad news is these kinds of sites are pretty much writeoffs today and can actually be detremental to the success of a business, both online and in real life. The good news is you can always get a new dynamic site built and reinvigorate your online presence in the process. Which is exactly what we did with EverybodyDance.ca. There were three major components to this project: First we needed to update the site to a modern look and make it dynamic so that Elaine and her staff could go in and change the content when they needed to. Secondly the site needed a dynamic calendar so current and prospective students could see what classes were available and when. 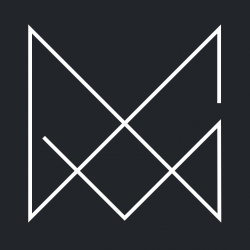 Finally we needed to up the profile of the site through quality content, optimized code and good old fashioned marketing. As with most of our small to medium scale projects we used WordPress as the base for this one. That way we could develop a sturdy theme with valid code and provide a platform from which Elaine and her staff could easily add, change and manage their own content. As a bonus WordPress has excellent search engine optimization built in, and with the addition of the All In One SEO Tag plugin this optimization reaches whole new levels. For the design we chose to go with the general red theme of the old site but brought it up to modern standards with a grey gradient wash in the back, more whitespace and a livelier look. The site also features a number of different page layouts depending on what type of content is displayed. In addition to the site itself our new marketing manager Anny also developed a business and marketing platform for Elaine. Doing an analysis of current customer numbers, income and expenses Anny analyzed the growth potential of the business as a whole and made a whole range of recommendations to help boost student numbers and revenue. As part of this plan was a tiered Google AdWords and Facebook Ads strategy that will be implemented and monitored over the next year. 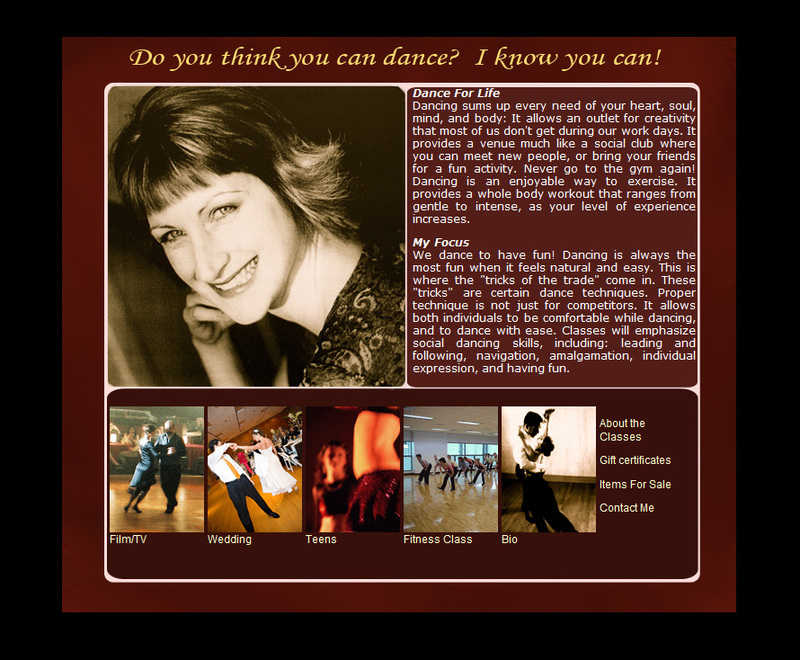 This strategy aims to boost the rankings and visits to the site and is designed to help Vancouverites looking for a good dance school find Elaine and Everybody Dance. In a market with hundreds of options that’s not an easy task but with the new site and the new marketing strategy Elaine is guaranteed to see more eager dancers enter her school in the coming year. And just for full disclosure: The reason I can say Elaine is a great dance instructor is because Angela and I have been going to her for 3 years and in that time we’ve gone from people who had no idea how to dance to someone who is at Silver 2 level in 12 different dances. what calendar/event plugin did you use? It’s called CGM Event Calendar and can be found here. I have customized it quite heavily but the base model works very well. It’s called CGM Event Calendar and can be found in the WordPress Plugin Directory. I have customized it quite heavily but the base model works very well. dude there is still a very large bug in this plugin.. it will not show dates properly.. even the demo site has not fixed this bug.. what gives?? F*ckin’ remarkable issues here. I am very satisfied to peer your article. Thanks a lot and i’m having a look forward to contact you. Will you kindly drop me a e-mail?